Suicides in prisons in England and Wales hit 25-year high, and who cares? 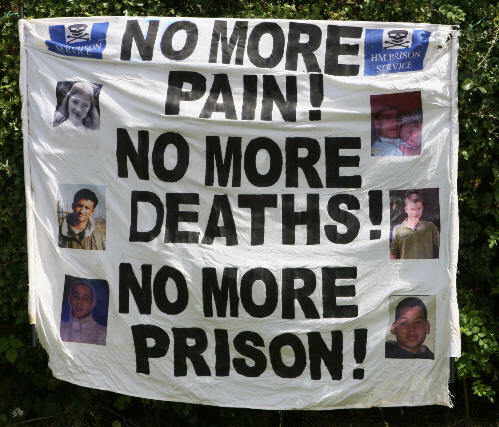 From a demonstration outside Styal prison, August 2008, to remember all the women who had died there. Styal is still open, and women are still dying therein. Today, the United Kingdom’s Ministry of Justice released Safety in Custody Statistics England and Wales / Deaths in prison custody to March 2016. To absolutely no one’s surprise, the numbers are bad, the worst in 25 years. One hundred people committed suicide in prisons across England and Wales, in the twelve months between March 2015 and March 2016. Last year, according to the Howard League for Penal Reform, the Prison and Probation Ombudsman for England and Wales, and the House of Commons Justice Committee, prison suicides in England and Wales reached a seven-year high. Last year, the Ombudsman found a 64% increase in self-inflicted deaths in custody over the previous year. Additionally, “there were self-inflicted deaths at 53 different prisons, 56% more than the previous year. This included prisons where there had not been self-inflicted deaths for many years, sometimes ever.” In February 2016, the Ombudsman published a “Learning Lessons Bulletin” on prisoner suicide within the first month of custody: “It is a sadness to me that this bulletin repeats learning that I have frequently published elsewhere, about staff not spotting or using essential information about risk of suicide. This suggests that lessons still need to be learned.” The sadness goes deeper and broader than repetition and not learning. The sadness is that the bodies pile up and nobody cares. None of this is surprising, and that’s the point. Critics say the system is in meltdown; it’s not. The system is working perfectly. Every year, a report comes out and some ask why the numbers continue to spike. Every year, the staff is blamed or the community or the individual prisoners. Every year, “safety in custody” is measured in suicide and self harm, and no one asks about well being and absolutely no one asks if those who die and hurt themselves in the pursuit of their own deaths belong behind bars in the first place. Every year, the public budgets for mental health are cut more deeply, and the butchers mutter in surprise at the “decrepit state” of the prisons and those who live and die therein. It is a sadness frequently published elsewhere. Has it ever been investigated any suicides within styal prison Manchester , as to what officers were on duty at the time of these suicides??? @Lorraine Watterson: Good question. As far as I know, there’s been no such inquiry, but we’ll look into it. Thanks for the suggestion.